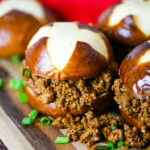 I don’t get out to sports bars to watch the games as much as I used to, and although I catch the game more at home these days, I do miss those delicious “bar bites” paired with a good cold beer. 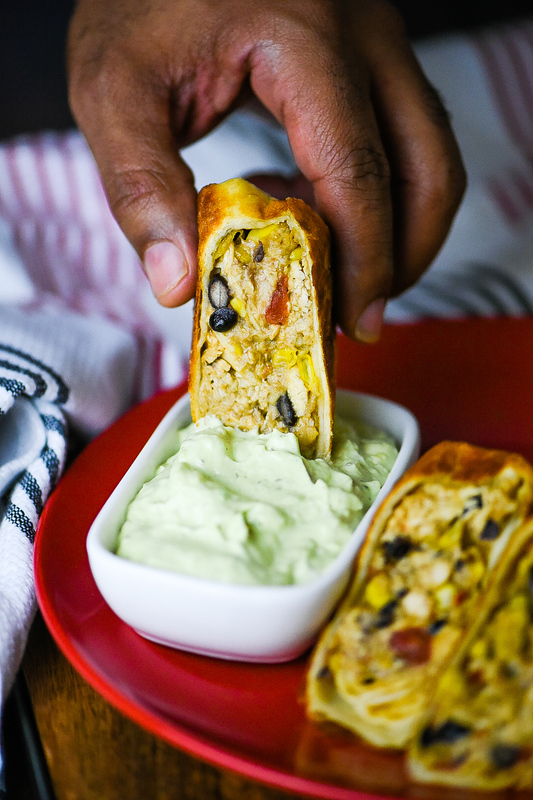 I remember the first time I bit into an egg roll filled with cheese, beans and chicken — I immediately knew I had to figure out how to remake them! 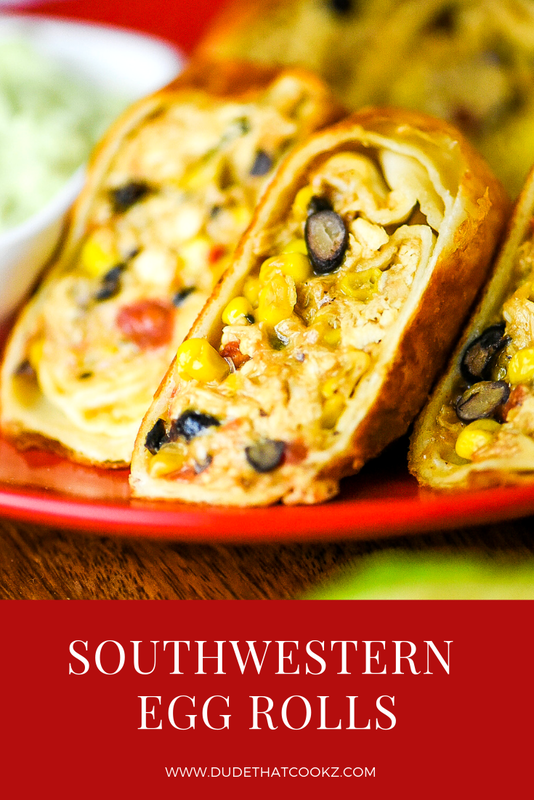 Today I bring to you my version of the perfect game time appetizer…my Southwestern Egg Rolls. 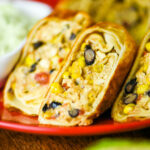 Rolled between a crispy fried flour tortilla is a filling that consists of black beans, sweet corn, cheese and rotisserie chicken (pre-cooked). That very simple coimbination is, not surpringly, very tasty. I went with pre-cooked rotisserie chicken for the recipe for a few reasons. First, it shaves off some preparation time because you don’t have to cook chicken breast. Second, the chicken is amazingly tender with zero assistance from me. Again, making it much easier plus it guarantees a juicy egg roll every time! 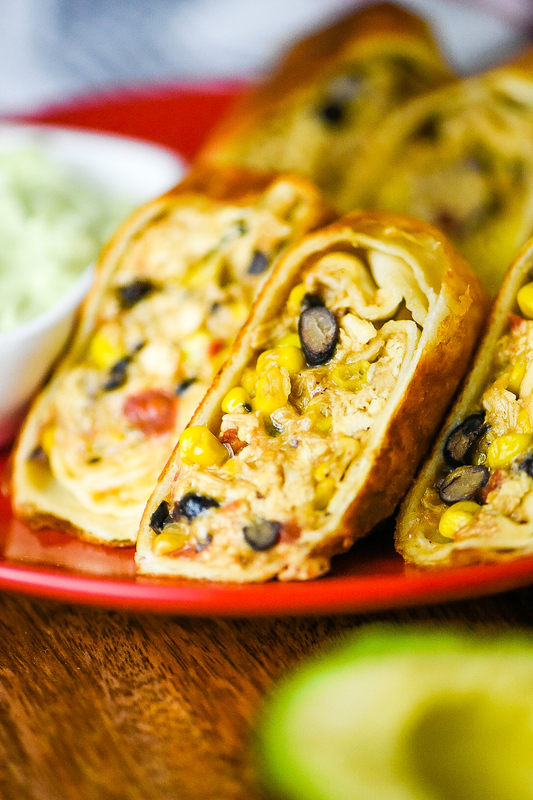 It may be hard for some to find a traditional egg roll wrapping but have no fear, using soft flour tortilla shells will work just fine; just coat them with a nice egg wash before frying. Once they are removed from the fryer, they can be enjoyed plain by themselves, with sour cream, guacamole, or even better, an avocado cream dip. 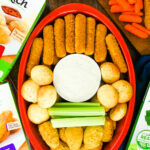 If you’re hosting game night and looking for a recipe idea that will be a surefire hit, this appetizer will definitely do the job! 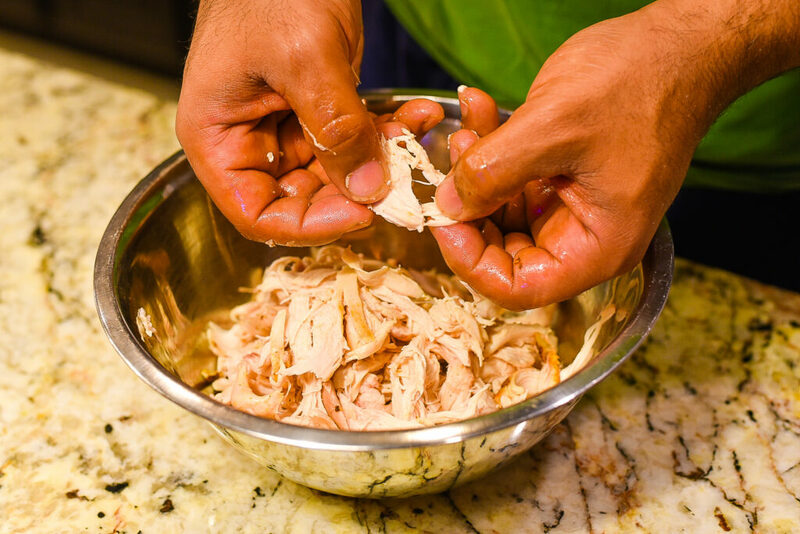 Begin by breaking down the rotisserie chicken into shredded pieces and place to the side. 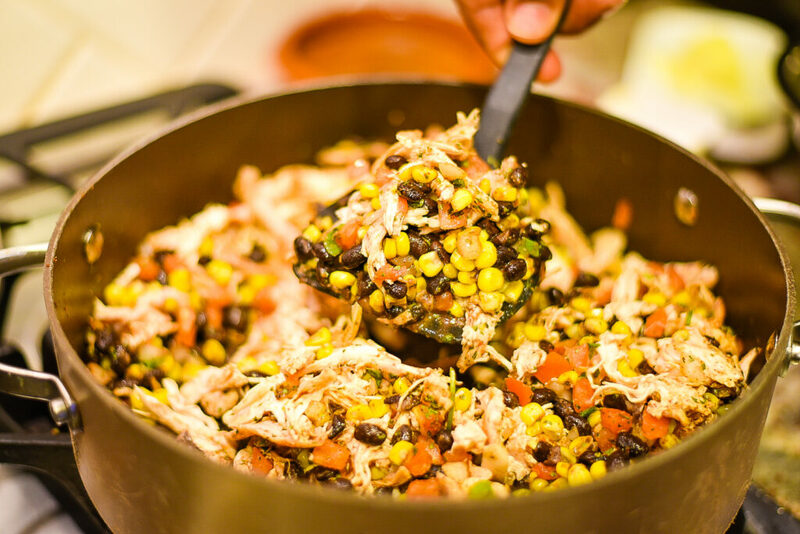 In a cooking pan on medium heat, add black beans, sweet corn and paprika then cook covered until tender for 5 minutes. Lower heat to medium/low heat and add all ingredients (except the flour tortilla shells). Cook for 5 minutes and simmer for 5 additional minutes. 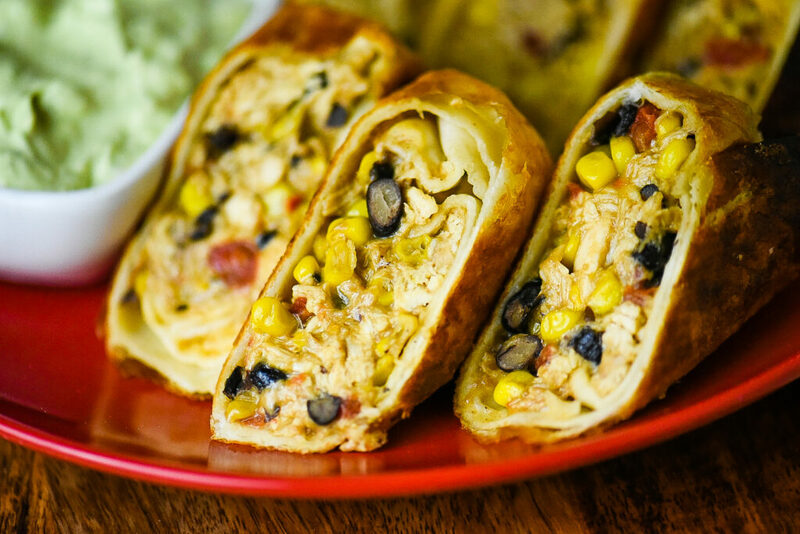 Add a tbsp of the chicken mixture into the center of the flour tortilla and fold from the bottom first, then the sides in and roll until its filling in sealed tight.Rrepeat for each egg roll being prepared. Slightly scramble the egg in a bowl and coat each of the tortilla shells with the egg. Place to the side. In a separate cooking pan, pre-heat to medium/high heat and add about 1 cup of cooking oil to the pan. Fry each roll until browned on each side. Remove from heat and cut diagonally. Serve hot with choice of dipping sauce.